Everybody deserves a comfortable and warm home during those rough cold months. If your home heating isn’t working properly, it’s important to work with a company you can trust to make repairs to your system quickly, reliably and within your budget. Call Northwest and you’ll see that our team makes your heating needs a priority. For 24 HOUR SERVICE , you can reach us anytime at 563-391-1344. From the time your call first comes in, until our technician leaves your driveway, you will find that we provide courteous, prompt and professional service. 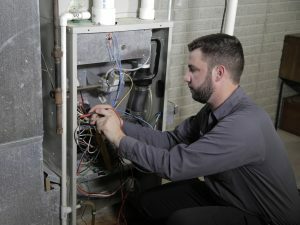 Our knowledgeable technicians have experience with all makes, models, and types of heaters and furnaces, including oil, gas, propane, electric, geothermal and more. And our White Glove Guarantee provides you with assurance our technicians will leave your home as clean as it was before their arrival. While there are many different benefits to preventative maintenance, there is one quote that always seems to ring true with our customers. Think of the heating in your home as you would your car. You wouldn’t drive your car 100,000 miles without changing the oil. Regular preventative maintenance will help you avoid costly repairs in the long run. We offer furnace preventative maintenance plans (1 furnace) for $99/year (or $8.25/month). Your agreement will include your annual furnace check. Plus as a service partner, you have no after hours or weekend fees. There is also an option to combine all plumbing, heating, cooling maintenance programs. All of the benefits are listed on our Service Partner Agreements page. Type 13707 and click "Submit"
Type 51961 and click "Submit"